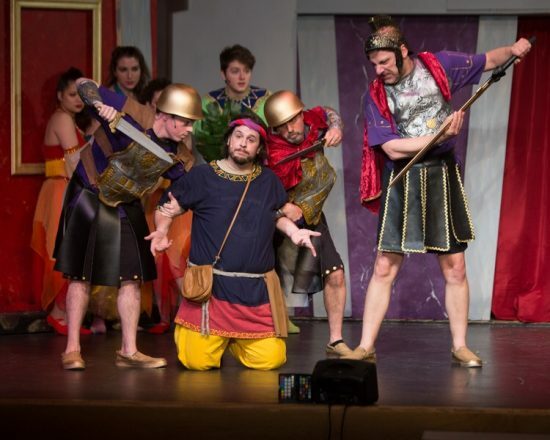 Pseudolus (Bob Gudauskas) faces death at the hands of Miles Gloriosus (Rich Greenslit) and his soldiers. Photo by Russell Wooldridge. “A Funny Thing Happened on the Way to the Forum” may not be Sondheim’s most well-known musical, but it’s certainly a classic. The story—which is a quirky, lighthearted comedy, as the company enthusiastically informs us in the iconic opening, “Comedy Tonight”—follows a slave named Pseudolus (Bob Gudauskas) as he attempts to set up his master, Hero (Tommy Malek), with a recently-sold courtesan named Philia (Rachel Sandler). If he is able to help the pair, his master will free him. Eager to become a free citizen, the crafty and quick-witted Pseudolus goes to great lengths to achieve his goals, constantly coming up with new lies and further complicating the situation. In the end, of course, everything wraps up neatly, in the spirit of the ancient Greek and Roman comedies upon which the show is inspired. Pseudolus, the show’s main character, is portrayed charmingly by Bob Gudauskas. Gudauskas’s incredible energy and captivating stage presence grabs the audience’s attention from the show’s first note, as well as a nice, full voice showcased in songs like “Free,” and his natural comedic energy is well-suited to this show’s silly script. It’s impossible that any audience could feel bored watching Gudauskas perform. Tommy Malek’s was similarly charming as Hero; his performance perfectly captured everything from the character’s youthful awkwardness to his sweet romantic nature. Malek is also equipped with a fantastic voice and incredible control, able to switch effortlessly from a brassy belt to a softer, sweeter tone. Rachel Sandler, who plays his dim-witted love interest, Philia, also has a golden voice, making their duets truly harmonious. …it never feels stale or outdated, thanks in part to the timeless writing of Sondheim, Shevelove, and Gelbart, and in another part to the outstanding talent of the cast and the superb direction of Conni Ross. The remainder of the supporting cast includes Don Patterson as Senex, Todd Hochkeppel as Erronius, Richard Greenslit as Miles Gloriosus, Ande Kolp as Domina, Matt Scheer as Hysterium, and Jeff Dunne as Lycus, each of whom expertly delivered some of the show’s most side-splitting punchlines. The ensemble was also invaluable; their energy kept the show moving and the group numbers, including “Bring Me My Bride” and “Funeral Sequence,” were a joy to watch because of it. Choreography by Tina DeSimone was a superb blend of classic Broadway pizzazz and physical comedy, especially in numbers like “Everybody Ought to Have a Maid,” where every other lyric is an innuendo. Along with the talent present in the cast, another one of the most impressive aspects of this production was the set, designed by Alex Porter with set decoration by Jessie Krupkin and Bill Pond. The three houses around which the show centers—the house of Senex, the house of Lycus, and the house of Erronius—were each painted their own distinct color, trimmed with an eye-catching shade of gold, and featured functional balconies, intricate artistic details, and even Roman-style statues that truly looked like they could have been made of marble. The costumes, designed by Linda Swann, were a bit less extravagant, but still looked excellent on stage—particularly amusing were the eunuchs’ sparkly silver skirts and the courtesans’ various garbs. “A Funny Thing…” is undoubtedly a classic piece of musical theatre, in every sense of the word; it features classic melodies, classic comedy, and is even based off of the tropes and traditions of classical theatre. But it never feels stale or outdated, thanks in part to the timeless writing of Sondheim, Shevelove, and Gelbart, and in another part to the outstanding talent of the cast and the superb direction of Conni Ross. “A Funny Thing…” is the show to see if you’re in the mood for a witty plot, fast-paced humor, an energetic cast—and a happy ending, of course! Silhouette Stages’s “A Funny Thing Happened on the Way to the Forum” plays March 16th, 17th, 18th, 23rd, 24th, and 25th at Slayton House, located at 10400 Cross Fox Lane, Columbia, MD. For tickets and more information, click here.